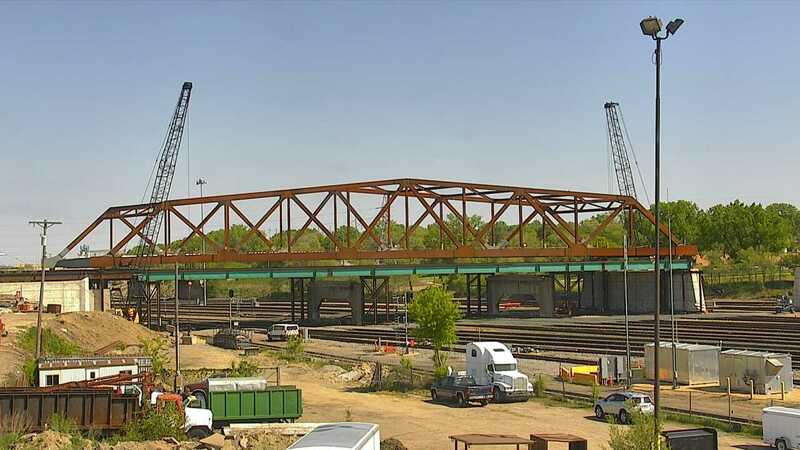 Westbrook was contracted by Lunda Construction Company to design temporary measures to facilitate the removal of the old five-truss span and to allow for the roll-in of the new 300′ long bridge truss over 13 live railroad tracks for the St. Anthony Parkway Bridge in Minneapolis, MN. 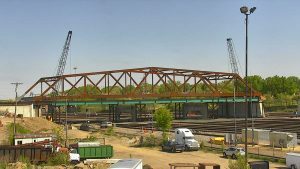 Temporary measures entailed multiple temporary bent designs, girders for supporting the rolling truss, and cribbing and lowering jack systems to set the truss on the new piers. In the photo you see here they’ve just finished rolling in the new 300′ truss. Also, check out our Facebook page https://www.facebook.com/WestbrookEng/ where you can see a short video we pieced together of stills from the live web cam.